I am a 14 year old girl in year 8 who wishes to improve my 100 meters running time. I have never competed in a "real" 100 meters race before although I have won 80 meter sprints at my primary school (yr7). My main issue is although I can start quickly and often take the lead I cannot / don't sustain that speed for long enough and other runners overtake me. How can I improve my running from a beginners point of view? I hope I have provided adequate detail. Thanks for your questions about your 100m racing. Unfortunately I am much more of a long-distance runner than a sprinter. So I am not really best positioned to provide you with advice. The shorter the distance, the more important it becomes to do speed workouts and resistance training. 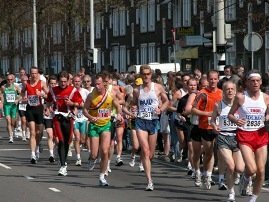 Just look up the differences in physique between sprinters and marathon runners. Sprinters look a lot stronger / toned than marathon runners. Sprinters do a lot more strength training, plyometric exercises and tough intervals. Now, I am not going to tell a 14-year-old to go pump iron and do brutal work-outs. What you can best do is find a gym teacher at school or coach at an athletics club and have them create a work-out schedule for you. Or create a work-out schedule together with them.